The Maker Movement is having a noticeable impact on the Wenatchee Valley and North Central Washington. We are witnessing a homegrown, youth-directed revolution that is building community in new and creative ways, providing new opportunities for young people to exercise their leadership, and is energizing and transforming a variety of institutions, including the North Central Regional Library, the Wenatchee Valley Museum and Cultural Center and local school districts. This local Maker Movement has enjoyed widespread support and the momentum is building. Where this will lead is anybody’s guess, but it appears to herald a significant shift in our region. The Maker Culture is a nationwide movement that encourages tinkering, the use of technology and creativity to foster innovation in local communities. It’s seen by many as a way to reinvigorate manufacturing in this country, through robotics, 3-D printing and electronics. But the heart of this effort has more to do with creativity than it does cool tools. “Philosophically it is about tapping creativity in whatever form comes most naturally to the individual.” At a Columbia Elementary after-school program, she said, the kids were all over a leather-tooling project that allowed them to swing hammers. “The point is to let folks make something from scratch…..not following a kit, no recipe, no right or wrong answer. Make something out of wood, leather and even add something (they) designed and printed on the 3-D printer. “The resources we have now (3-D printer, electronics, robots, etc) remove previous barriers to being able to create what is in our mind,” she continued. Sam Monson, who was at the time a 7th grader at the Valley Academy of Learning, got the ball rolling when he approached the city about developing a Maker Space in the city — a workspace that can be used for anyone who wants to create things. Rolfs suggested that city of Wenatchee officials Steve King and Allison Williams meet with Monson to learn about his dream. “We really didn’t have any understanding of what (a Maker Space) was and what did that mean, ” said Williams. But Monson won them over with his passion and his desire to make a difference in the community. King is the director of community and economic development and Williams is the administrative services director. King and Williams were eager to follow up, with the encouragement and support of city council member Karen Rutherford. King was aware that there is a youth bubble emerging in the Wenatchee Valley and recognized the community could either create opportunities for kids to get involved in creative enterprises like Maker Spaces or have them engage in less healthy activities. He’s a fan of creatively engaging the next generation. Williams and King discovered that the White House had issued a challenge to mayors across the country to organize maker events, which led to the creation of the Mayor’s Maker Forum in 2014. At the end of the forum, Toth and Monson made a pitch for community support for a Maker Faire. Toth, a Wenatchee High School student, organized a group of like-minded individuals at the high school to start planning the event, with some logistical support from the city. The event was a smashing success. More than 1,200 people attended and were able to see a wide variety of makers in the community exhibit their work, from a musical instrument builder to kids flying their drones through an obstacle course. Makers are everywhere in our community and there is great potential for strengthening our economy, engaging kids and building a greater sense of collaboration and community here in North Central Washington. 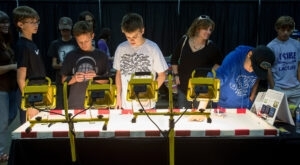 The Clean Energy Institute brought small solar powered toys for people to play with at Wenatchee’s Mini Maker Faire. 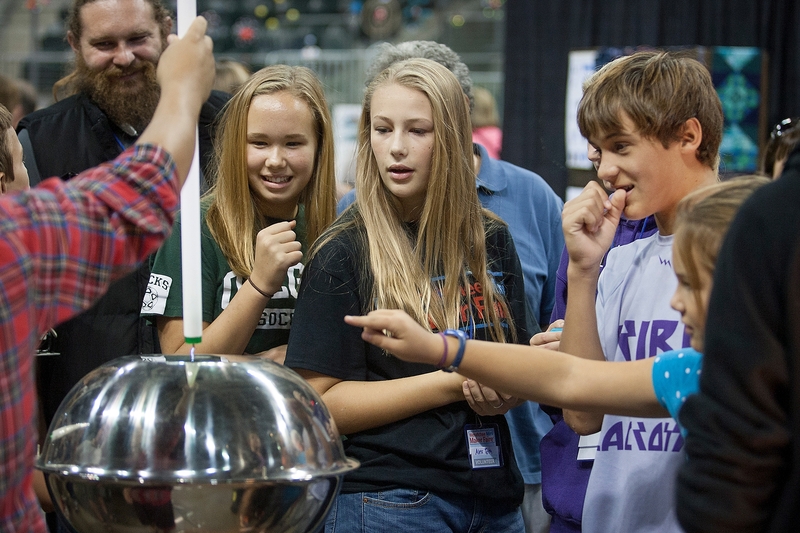 A tesla coil drew much interest in Saturday’s Mini Maker Faire at the Town Toyota Center. It was built by the Wenatchee Valley College Mechatronics Club.